With the largest oil reserves in the world, Venezuela was once the wealthiest nation in Latin America. But today, it is experiencing a historic economic collapse that has forced over 2.3 million citizens to flee the country. Since 2013, Venezuela has lost a third of its gross domestic product while inflation rates have soared at a record pace. The International Monetary Fund now predicts that the country’s inflation rate, which is already the highest in the world, could reach 1,000,000 percent by the end of the year. No matter how you analyze the situation, one thing is clear: socialism is the root cause and the main driver of the tragic fall of a country that once championed democracy and prosperity. Venezuela’s failed socialist experiment serves as a reminder for the United States, where support for socialism has noticeably increased in recent years. The crisis that is on display in the South American nation highlights why socialism is a threat to the freedom that we all deserve. The once-democratic nation did not become socialist overnight. In fact, the process took generations to be completed. During the first half of the 20th century, Venezuela had a significant level of economic freedom. Most sectors of the economy, including the oil industry, were privatized, and the individual tax rate remained low at 12 percent. Furthermore, labor laws were flexible, corruption was kept in check, and foreign trade was relatively unrestricted. However, beginning in the 1950s, politicians began taking away these economic freedoms by installing exchange-rate, price, and rent controls, while simultaneously nationalizing private businesses and forming state corporations and regulatory agencies like Cordiplan. They also tripled the marginal tax rate to 36 percent in the 1960s. Due to the massive corruption in the government, wealthy elites disproportionately benefited from the government revenue. For instance, the urban population that had strong ties to Democratic Action, a major political party, had access to state resources that were not available to the poorer, rural migrants. The corruption increased when oil prices dropped in the late 1980s and suffocated the country’s economy. By the end of the century, the loss of economic freedom had decimated the Venezuelan middle class and created a massive gap between the elites and the poor. The growing economic divide led to the rise of Hugo Chávez, a populist who campaigned on transforming the partially socialist Venezuela into a full-scale socialist state. After being elected in 1998, Chávez replaced the decades-old Venezuelan constitution with a new socialist constitution in 1999. The new version declared employment, healthcare, and housing as basic rights that must be provided by the state. Additionally, Section VI of the Constitution stated that the government is responsible for promoting agriculture and manufacturing, among other sectors of the economy. In other words, the new constitution marked the end of the free market in Venezuela. Chávez’s regime then doubled down and passed additional legislation that redistributed land and wealth. His socialist ambitions reached a new height in 2004 when oil prices surged globally. Venezuela’s economy boomed, and Chávez began doling out billions of dollars from the newfound oil revenue to implement unsustainable social welfare programs, such as subsidized food, education, and healthcare. These welfare programs increased Venezuela’s dependence on oil; by 2011, it made up 95 percent of the country’s exports. The lack of diversification of the economy put the country at major risk, as oil prices were cyclical. Nevertheless, Chávez, who felt the need to satisfy his constituents, kept promoting socialist policies while refusing to develop other channels of income. Because he died of cancer in 2013, Chávez never witnessed the consequences of his economic ignorance. Shortly after Chávez’s hand-picked successor, Nicolás Maduro, was elected president, oil prices fell by 70 percent. Venezuela’s over-reliance on oil combined with uncontrolled government spending rapidly increased the national debt, and the economy began to crumble. Rather than implementing a fundamental solution to the crisis, Maduro responded by increasing the money supply, thereby devaluing Venezuela’s currency. This led to a hyperinflation that is now making it nearly impossible for the majority of Venezuelans to purchase food, medicine, and other necessities. The National Survey of Living Conditions, a study conducted by three Venezuelan universities, showed that Venezuelans lost an average of 24 pounds in weight in 2017. The working class that once supported Maduro is now turning on him for a very good reason. 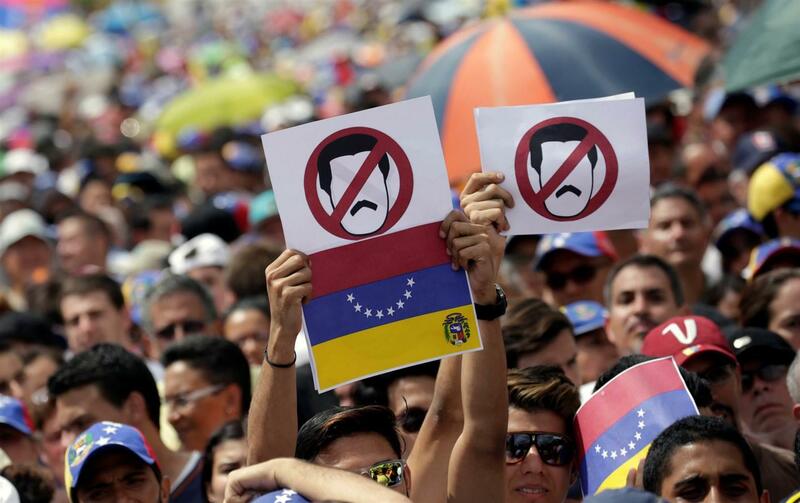 However, Maduro has managed to suppress the political pressure by consolidating his power. Over the past few years, his regime has become authoritarian by rigging elections, politicizing the Supreme Court, and silencing his political opponents. Today, children are dying of hunger, innocent civilians are being killed by the Venezuelan security forces, and millions of citizens are being deprived of basic freedom. As more socialist policies were implemented, the productive efficiency of the Venezuelan economy sharply decreased. Accordingly, the nation with the largest oil reserves in the world is now forced to import oil from foreign nations. This productive inefficiency combined with other factors like uncontrolled spending led to an economic depression. When hyperinflation, scarce resources, and unemployment began to affect the daily lives of ordinary citizens, the economic collapse transformed into a broader social crisis. The need to solve these conflicts called for centralized planning and provided an opening for centralized political power in the form of dictatorship. What we witnessed in Venezuela is a textbook example of why socialism leads to dictatorship. Socialist economies, or command economies, are noticeably more inefficient compared to those of free market because they lack entrepreneurship, incentives, innovation, and an accurate assessment of relative scarcity. This is a major reason why Venezuela continued to depend heavily on oil and failed to diversify its economy. When economic inefficiency is not addressed in a timely manner, the economy collapses and creates chaos in society. In his book, The Road To Serfdom, Friedrich Hayek, a Nobel-Prize winning economist, explains that centralized economic decision-making inevitably leads to dictatorship because economic inefficiency ultimately creates social problems that increase the need for centralized planning. It is extremely difficult to separate the centralization of economic power from that of political power at a large scale. This is why socialism is a threat to the freedom that we enjoy today. It is unlikely that the United States will be in Venezuela’s position anytime soon, but there is no denying that socialism has become increasingly popular in this country, especially among millennials. To those that support socialism, Venezuela should serve as a reminder of the importance of protecting America’s democratic foundations and capitalist economic system. Posted in Opinion and tagged corruption, dictatorship, Economic Crisis, Hugo Chavez, Nicolás Maduro, Socialism, Venezuela. Bookmark the permalink.